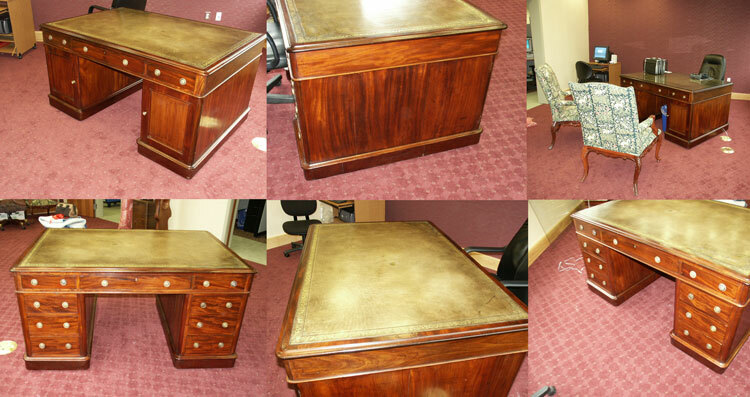 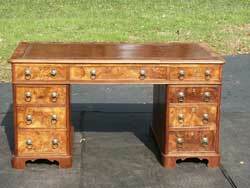 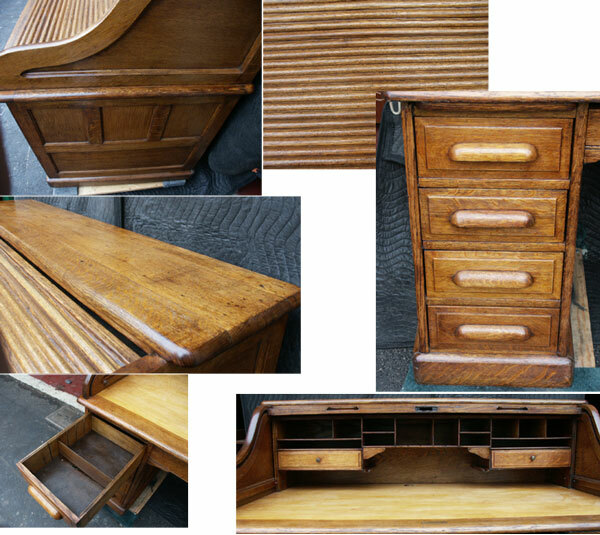 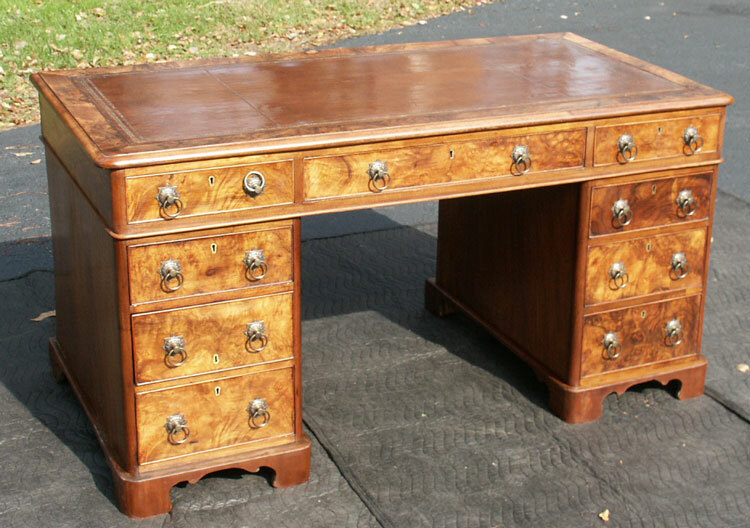 This Edwardian Partner's desk, the prize possession of a local CEO, arrived in a depressed condition. 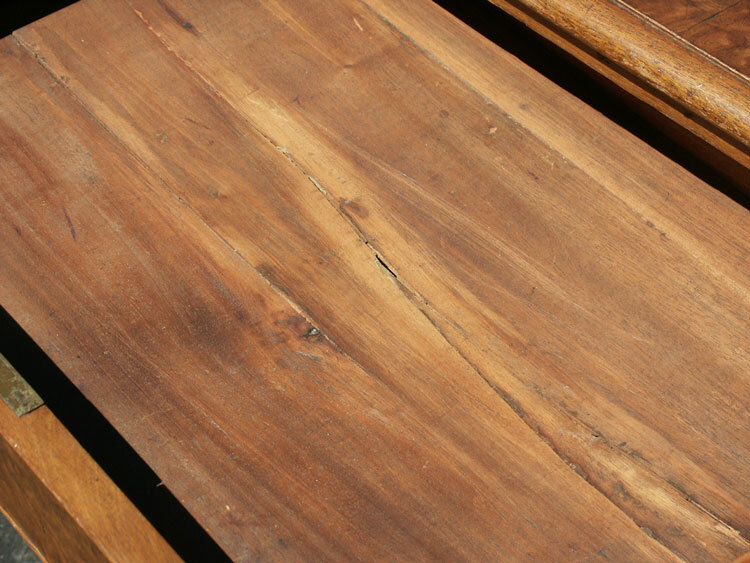 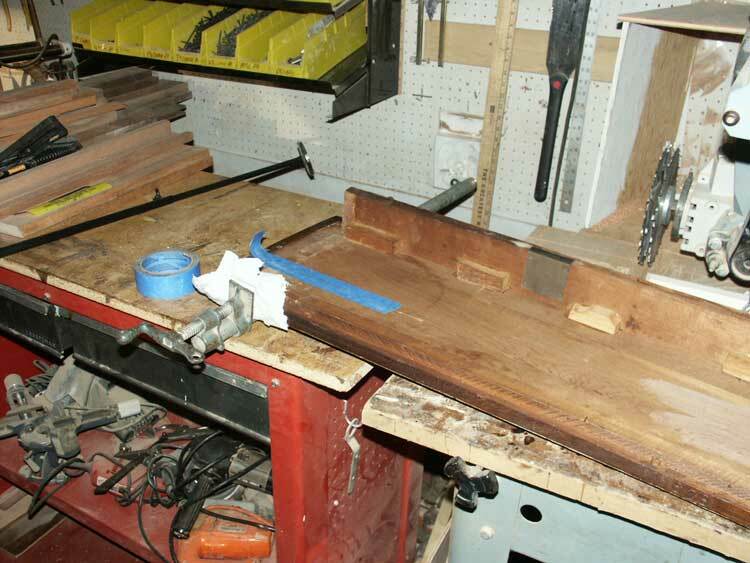 The skirt was rapidly loosing veneer, a finish almost gone, stains on the leather desk surface, and wood dry and brittle - especially the drawer bottoms. 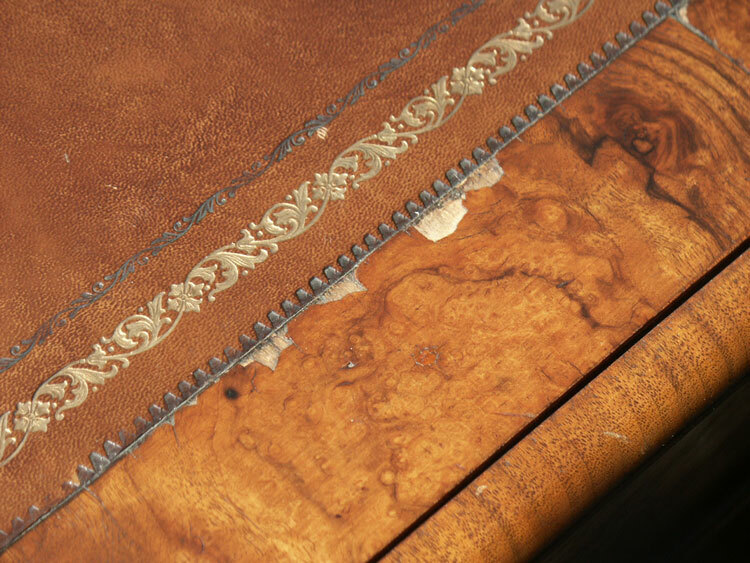 Restoration included a complete finish conservation, replacement of the pedestal skirt veneer, moisturizing of the piece, and removing the stains from the leather top. 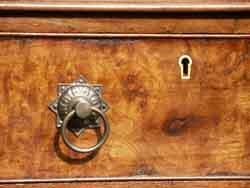 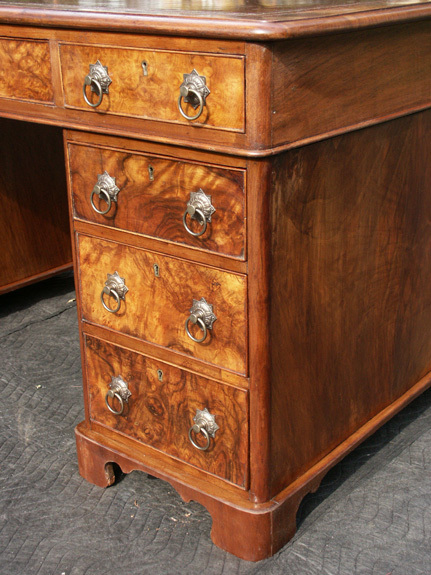 Edwardian furniture, later Victorian period, is hitting a major jump in value in the collectors market. 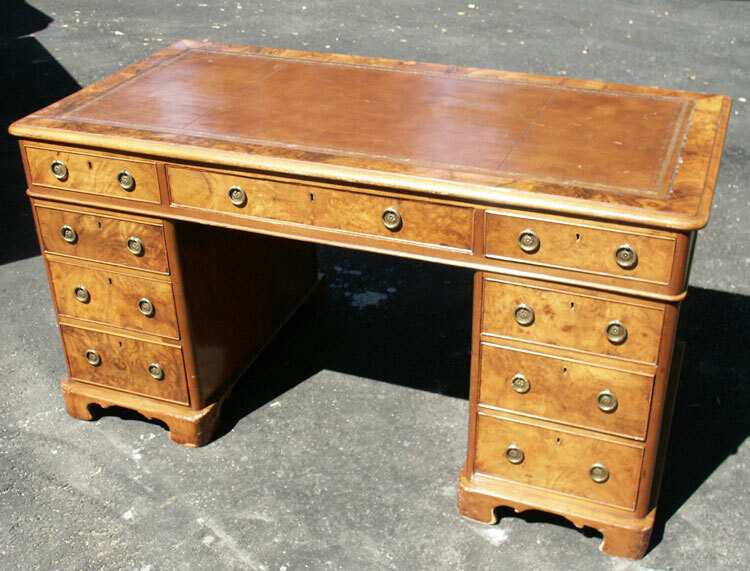 Where previously these pieces were tossed to the curb, the past ten to twenty years has shown a resurgence in popularity making restoration of these well made desks a wise investment. 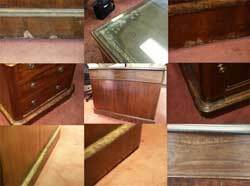 These photos illustrate a classic scenario, a veneer piece refinished probably 20-25 years ago in lacquer. 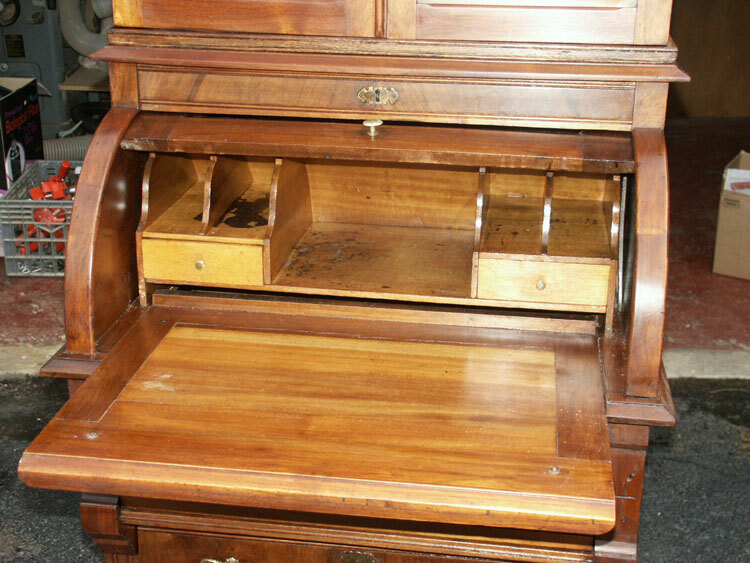 The unit is in excellent structural shape, requiring only minor attention to one drawer bottom. 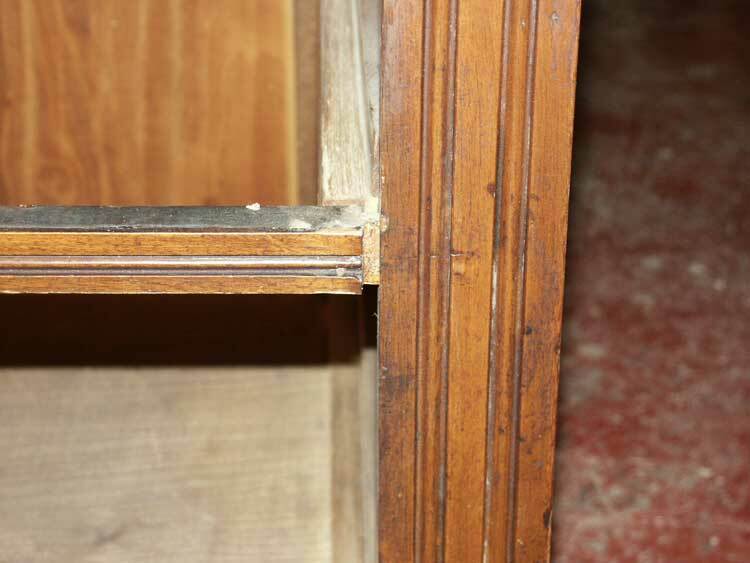 However, the veneer is now choosing to leave it's host as previous stripping and application of lacquer finishes with drying agents failed to provide the much needed moister to keep a piece alive. 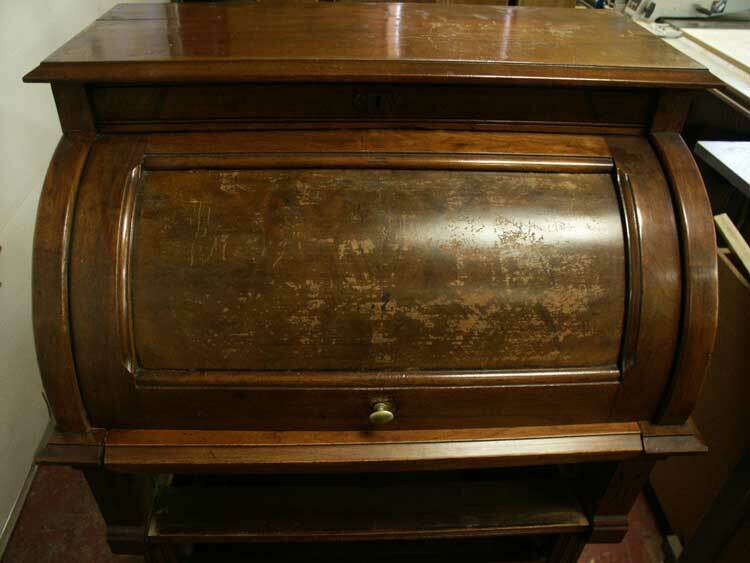 This time the existing finish must be removed to properly treat this piece, using appropriate chemicals to revitalize the veneer and help prevent cracking, flaking, and peeling ... not to mention uncover the true beauty of burl walnut which is lost under the plastic shine of lacquer. 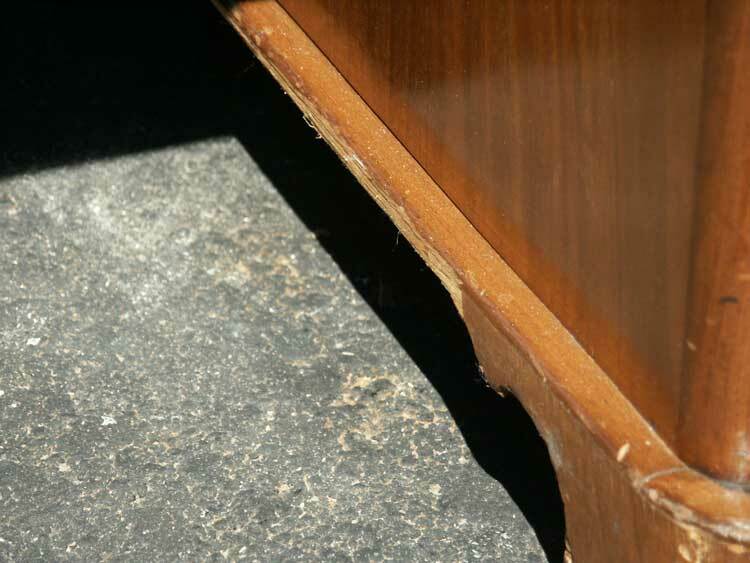 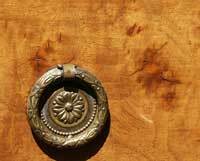 Shown above to the left, our process will fill these cracks and impart oils into the material to slow the process of deterioration. 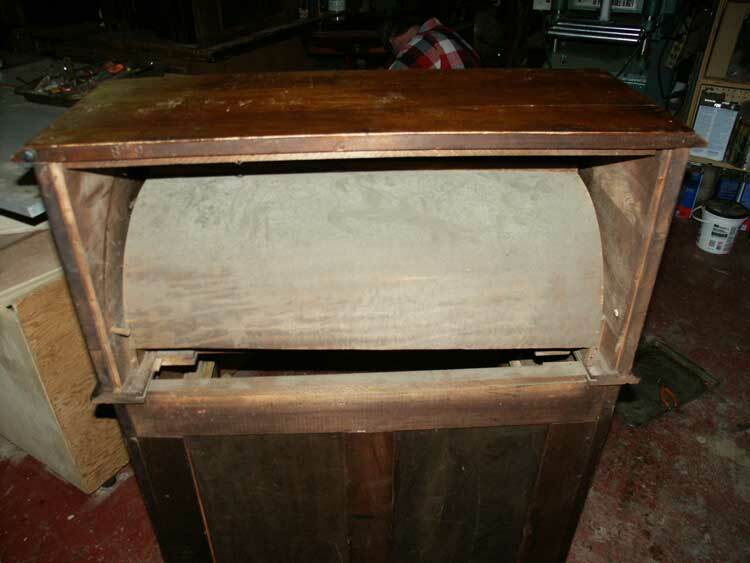 Note the cracking towards the center right. Replacing the lost veneer from physical abuse, and filling in the cracks will bring this piece back to life. 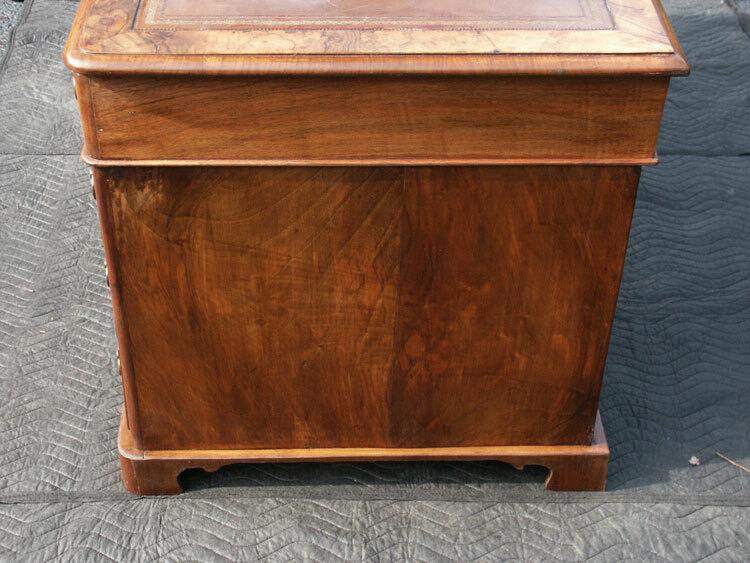 A renewed appeal from a hand rubbed shellac and tung oil finish inside and out will seal the deal and allow this well crafted piece to last into several coming generations. 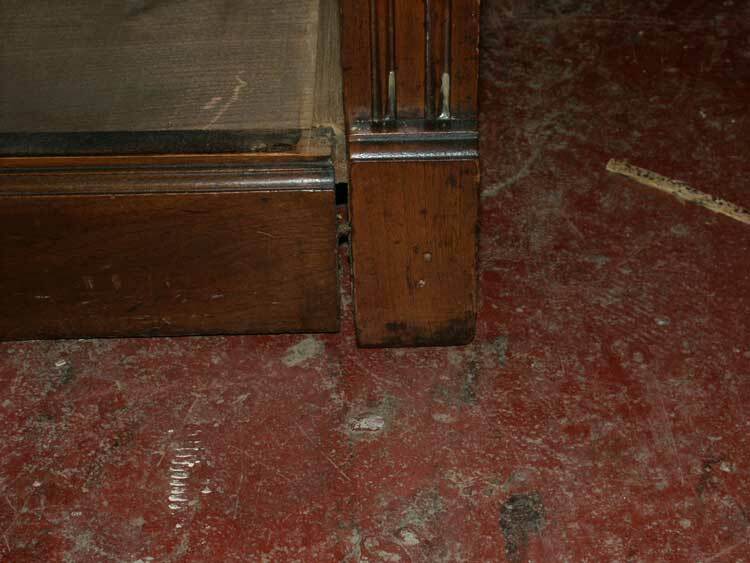 Water damage, lost veneer, etc ... all can be restored. 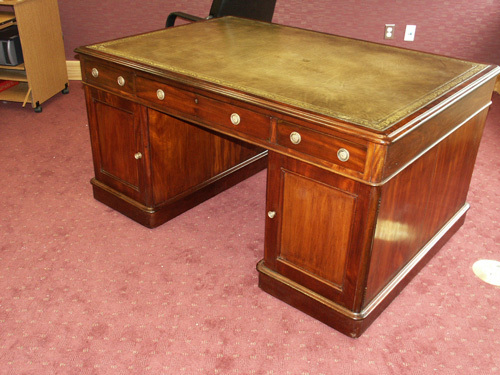 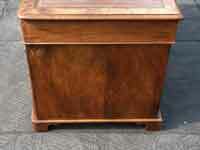 This is an outstanding example of an Eastlake design, with excellent graining in the wood. 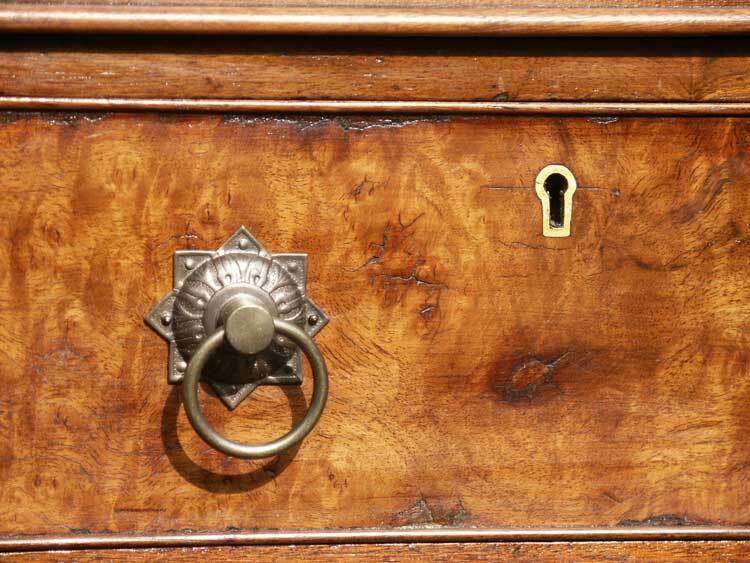 There is a dramatic upswing in the value of these early Victorian pieces. 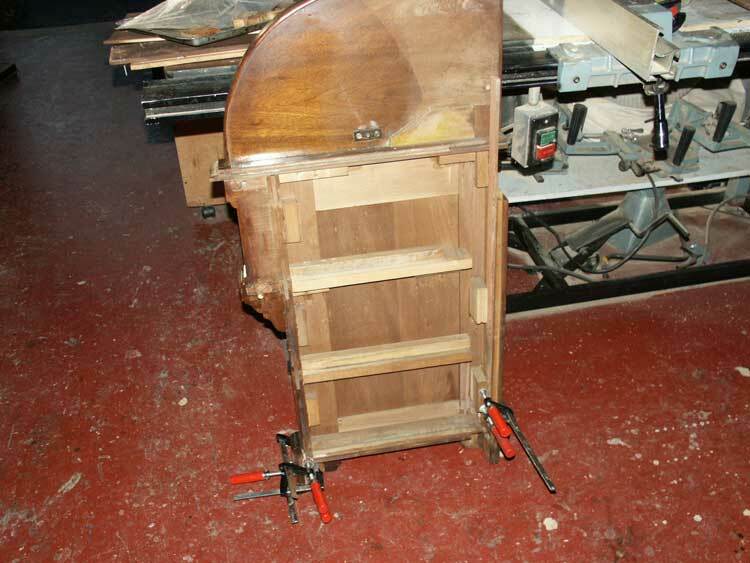 This unit came in literally in pieces, the base unit seemed to have not one joint intact. 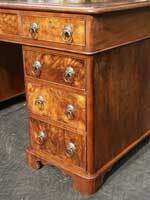 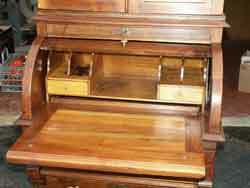 Very common, this era of furniture, although displaying great attention to detail in selecting the best woods, employed limited technology in machine made joints. 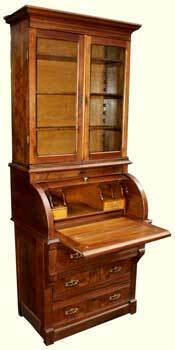 The furniture was designed for easy manufacture of parts and assembly. 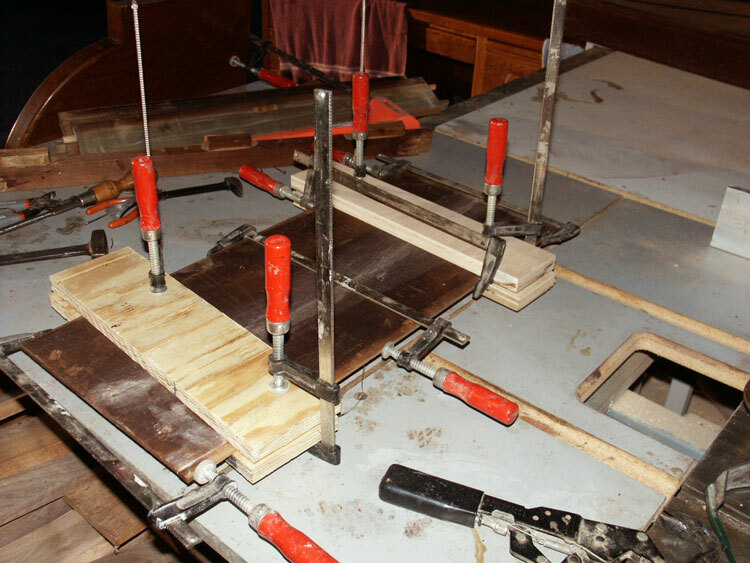 The result is many pieces simply fell part in time. 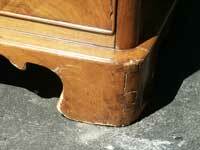 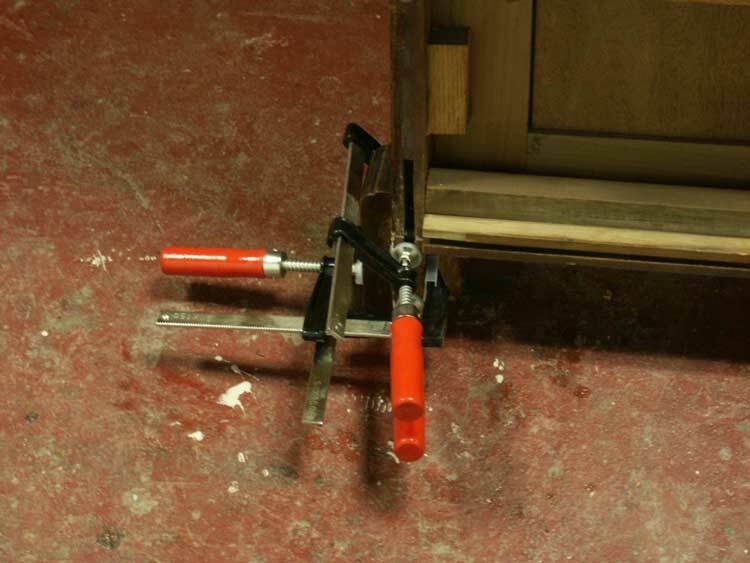 Repaired time and time again, but usually coming apart again with joints relying on inadequate glue. 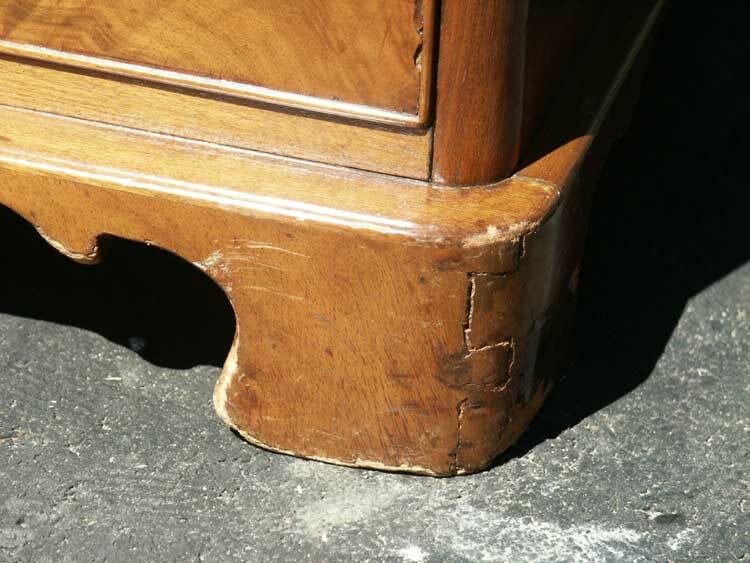 Our task included fully disassembling the base, cleaning the joints, and reassembling the piece along with a full finish conservation.